(Nanowerk News) Researchers have developed a new method for studying bacterial swimming, one that allows them to trap Escherichia coli bacteria and modify the microbes' environment without hindering the way they move. The new approach, described this month in Nature Methods, uses optical traps, microfluidic chambers and fluorescence to get an improved picture of how E. coli get around. (Left to right) University of Illinois physics professor Yann Chemla, graduate student Patrick Mears, physics professor Ido Golding and graduate student Lance Min developed a technique that allows researchers to watch bacteria swim normally. The microfluidic chambers provide a controlled environment in which the bacteria swim, and allow the researchers to introduce specific stimuli – such as chemical attractants – to see if the microbes change direction in response to that stimulus. Optical traps use lasers to confine individual cells without impeding their rotation or the movement of their flagella. 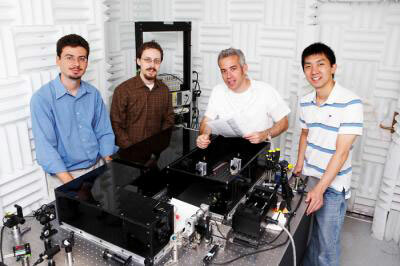 University of Illinois physics professor Yann Chemla, who co-led the study with physics professor Ido Golding, calls the optical traps "bacterial treadmills." Movement of the bacterial cell alters the light from the laser, allowing the researchers to track its behavior. Fluorescent markers enhance visualization of the bacteria and their flagella under a microscope. Three to six helical flagella emerge from various points along E. coli's rod-shaped body. When they rotate in a counterclockwise fashion (as seen from behind), they gather into what looks like a coordinated bundle that pushes the bacterium forward, causing it to corkscrew through its environment. But when one or more flagella rotate in the opposite direction, they splay apart, reorienting the bacterium. This "run and tumble" behavior has long been of interest to scientists for two reasons, Golding said. First, the elaborate mechanics of bacterial swimming "tell you a lot about biomechanics," he said. And second, "it serves as a paradigm for the way living cells process information from their environment." Earlier studies have been unable to follow individual bacterial cells moving in three dimensions for more than about 30 seconds, the researchers said. And it is nearly impossible to determine what cues are spurring a cell to move in a given direction. The new method addresses both of these problems without altering the normal behavior of the bacterium, they found. "Because the cell is immobilized, what we do is change the environment around it," Chemla said. "We can set up a flow cell that has two different concentrations of some chemical, for example, and see how the bacterium responds. Technically we're moving the swimming pool relative to the swimmer," he said. The new approach allows the researchers to track a single bacterium as it swims for up to an hour, "which is orders of magnitude above what people could do before," Golding said. This will offer a new look at questions that so far have been unanswerable, he said. "For example, some people have asked whether E. coli has a nose. Does it have a front and back?" Golding said. The team's observations indicate that while the bacterium can travel in either direction, most E. coli have "a pronounced preference" for one over the other, he said. The researchers found that after most tumbles, a bacterium usually continued swimming in the same general direction, but that about one in six tumbles caused it to change direction completely. They were also able to quantify other features of bacterial swimming, such as changes in velocity and the time spent running and tumbling. The new technique will allow researchers to address many more questions about this model organism, they said. "That's the typical way biology moves forward," Golding said. "You develop a new measurement capability and then you can use that to go back and look at fundamental questions that people had been looking at but had no way of answering."